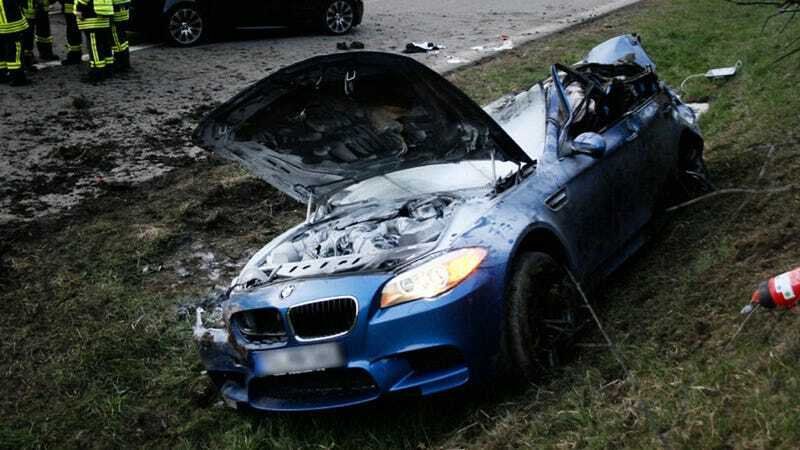 We talk about German supersedans as "built for the Autobahn" and other clichés about the country's sometimes-unrestricted highways, and this 2013 BMW M5 proves it after crashing at 186 mph without killing the driver or passengers. The accident occurred on Tuesday evening and was caused by a vehicle merging onto the A81 freeway near Tuningen, not far from the Swiss border in southwest Germany. The 60-year-old M5 driver swerved left to avoid the incoming car, lost control, and crashed repeatedly into both the left and right-side barriers lining the road. The M5 rolled several times before coming to rest over 320 feet (100 meters) down in the grass. Smoke was coming out of the hood, but the driver's two sons, following in an M6 and an M3, were able to rescue their father and put out the fire with a fire extinguisher. Looking at the damage on the car and with reports that it was travelling around 186 mph (300km/h) before leaving the road, it's remarkable that anyone survived at all. The road was completely shut down for several hours to clean up the completely totaled car. The driver and his 20-year-old passenger in the car were seriously injured and have been hospitalized. Their dog in the back seat was also hurt. This particular Autobahn, the A81 running from Stuttgart almost to the Swiss border, is one of the longest stretches of unrestricted road in Germany. Even with a supposedly perfect car like an M5, it's still a dangerous place for such high-speed driving.